> Almost all the kids at las Columnas want to go to the Camp and I am making a list. Here are some of them. Each one has a unique story. Many parents are single mothers, street vendors, or unemployed people. > Today I talked to Rosita (Camp organizer), she was sad that none of the Canadians will be at the coming Camp. She was amazed that this year so many kids were being sent to the Camp by the Canadian brothers and sisters. There is going to be an excellent priest with us and we will be having mass early in the morning before the activities start at the Camp every day. > I keep on praying about the kids in Huanuco. > I have already hired the bus and will be going this week to check about the Bibles. The amount of money raised for the Camp is giving me some flexibility to bring some of the kids from Huanuco. I’m still praying about this. 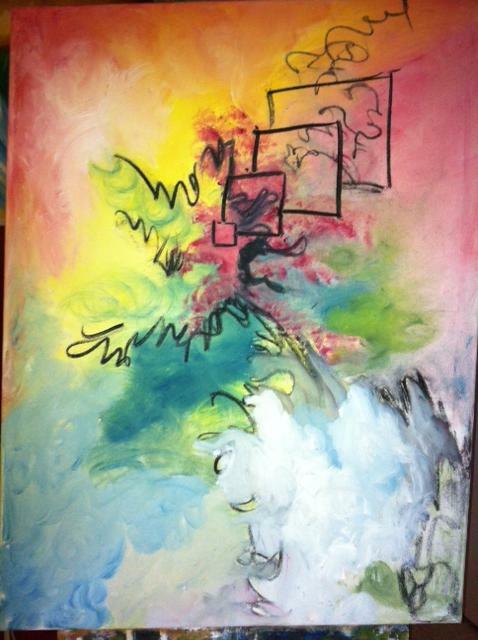 This painting was referred to Sept 13 prayer meeting. I heard the cold is intense over there. Here in Peru is totally the opposite with the Summer. Catholic welcome Lillian (???). I just know there is a welcome that never fails: LOVE. That is what I received when I first went to LJH near 10 years ago. May ‘love’ be always the strength of LJH. I have hardly been in touch with any one as time is always short. I’m still alive and having lots of fun in all I do. Here are few of last week’s photos. God is everywhere, especially when eating popcorn with the little ones at “Las Columnas”, downtown Lima. Peru is a country where close to 60% of the population is below 25 years old. Lima is a city with around 10 million people so you can imagine the action here: crazy car drivers, streets kids doing all kind of tricks in the streets to get few coins, great food, music, soccer, ocean, sun, even “the cirque du soleil” is going to be here for a whole month starting this weekend, the rally Dakar has been moved from Africa to South America and started last Sunday here in Lima. The Peruvian economy might be growing but corruption and distribution of wealth has not improve much the condition of the poor. Here in Lima, the Camp of Faith and prayer is coming soon (Feb 6-10). So far, it has been the main instrument to share about Jesus with so many children LJH has been involved with for the past 7 years. It’s a place where they can experience the love and presence of God. If you feel like sending a child to this Camp, the cost (all inclusive) is close to $40 plus $10 for transportation. It can be given to LJH (making sure is for the Peru Mission) and you can get a tax recipe. All of the children I take to the Camp are poor and/or from dysfunctional families where they are abused. Being for few days in a place where they can play, laugh, share activities, sing, have a good bed, food and hear about Jesus can be a life changing experience for many of them. This last Sunday I took few toys to ‘Las Columnas’ (the project down town Lima), but I did not have enough presents for all of them (they are close to 60 kids) so I had some draws with the few things I took. There was a cute teddy beard (I bought for a $1 at the New Edinburgh garage sale), many of the girls, especially those between 10 -12 years old group wanted this toy. A young woman (16 years old) that does not even live at las Columnas participated in the draw and guess what, she got the right number for the teddy beard. I was a bit disappointed as I thought she was too old to appreciate it but God is never wrong. A couple of years ago, some of the girls shared with me about the condition of a girl living also down town, that had been physically abused by her own father since she was 9 years old (he’s been in jail for the last 3 years). I was praying to meet her this time. Well this was the girl that got the teddy. God is always perfect. Although she looks quiet normal she is very broken inside. She might be one that will come to the Camp. Each child is special and I get to know them better year after year. There are many stories as each child is unique but I better say good bye now. The last three photos are: some members ‘of my family and a couple of Peruvian dishes: ‘cebiche’ and something nicer than potatoes called ‘yucas’. They were prepared by my brother in law who has recently discover that he loves to cook. Reviewed the highlights of Dec. 8, 2012 meeting specially the attacks by the evil-one specifically sickness, Bishop’s ignorance of our move. 1. In the dream I was putting on a brand-new roof on three houses. The three houses I believe represents the three communities LJH, St. Philip and St. Claire. There is a need for spiritual covering for these communities. 2. Prince George BC. Through human sinfulness, through sexual abuse the Oblates lost considerable money and resources in this part of BC. In the dream I was returning to teach in a brand-new school in this city. Interpretation: As we repent and return to the Lord he forgives our sins and we find spiritual and physical restoration. God sometimes only shows a beginning (a small segment) of the road we must take. We have to walk by faith not by sight. Need to discover who we are, individually and collectively and discover how God wants us live our lives. Are we investing ourselves into God’s Kingdom and into our Intimate relationship with God? To spend time with God is to be close to the powerhouse. Perfecting our Love, Service in Humility. We are not the ones that going to make things happen. God will make things happen. Loving God is to do His will and develop intimate relationship with Him. 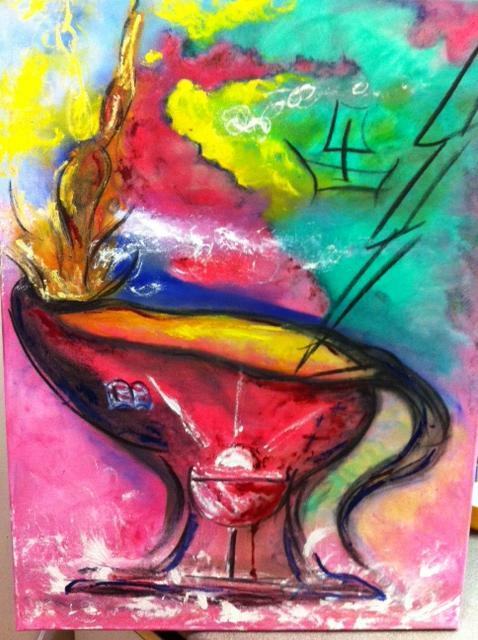 Prophetic Art (Diane) : Whirlwind, Fire of the Holy Spirit both in the air and at the bottom of well. Our Vision for 2013 : Make our (my) heart(s) a dwelling place for God. You are currently browsing the Lift Jesus Higher blog archives for January, 2013.